Let’s face it! Being a kid is hard! Sure, as we look back on those days of 3 automatic square meals daily, a roof above our heads, and all the bills to enable a relatively comfortable existence all being taken care of by a magical invisible force while we remained oblivious to it all, it doesn’t seem like it was hard at all. However, as we consider that these were the days of self discovery and beginning to grow into ourselves, filled with all of our insecurities, before our minds, personalities, and inner strength were fully developed, in retrospect, these were some pretty trying times. Social acceptance within our desired peer groups tend to rank high on our list of priorities as we grow into our own. Am I cool enough ? Am I good looking enough ? Am I smart enough ? Am I good enough ? Those are the thoughts that tend to dominate a child’s mind as their young minds develop and as their social circles form. The fragile developing mind of a child needs continuous encouragement to grow, to mature, and to develop, as an adolescent girl or boy evolves into who they were created to be. 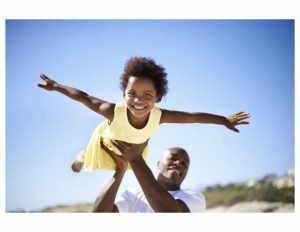 The right source of encouragement from family, from friends, from mentors, or even from superheroes or other fictional characters, who enable a child to tap into their inner strength, can make all the difference in laying the foundation and empowering a child towards a lifetime of greatness. After all, who among us didn’t feel invincible and capable of conquering the world after an episode of Superman, Wonder Woman, or Batman ? In The Underdog with The Underbite, a little boxer puppy named Spud, the runt of a litter of 10 puppies, perseveres through being bullied by 9 big brothers and sisters, followed by serious health challenges, to become a fearless, caring, loving, dependable, awesome family pet who brought happiness and joy to everyone who ever met her. Based on a true story of our family pet, the story of Spud The Underdog is one of resilience and overcoming obstacles against all odds. In the story of Spud The Underdog, kids will find a relatable character, an alter ego if you will, who is able to fight through difficult circumstances to come into her own and live an impactful life. By also channeling their own Underdog Power, that invisible source of strength that arises within us when the odds are stacked against us, young children will be able to overcome any and every obstacle that comes their way. This book was written not only to introduce the world to a beloved family pet whose life story I believe is worthy of being widely known. More importantly, it is my hope that Spud’s story will serve as a source of motivation, of inspiration, of inner strength, to propel children pass all the difficult circumstances they will face in life. They may face bullies, they may be told they are not smart enough, not good looking enough, not good enough, not tall enough, not strong enough, and written off as somehow inadequate. If Spud’s story inspires even just ONE child to tap into their own Underdog Power, and sidestep, hurdle over, or power through any life obstacle that comes their way, chronicling her inspirational life story would have all been worth it. You may pick up a copy of “The Underdog with the Underbite” for that special child in your life on Amazon . If you are so moved, please also leave a quick review after reading the book and share your opinion about this story with future readers. Thanks and be blessed. 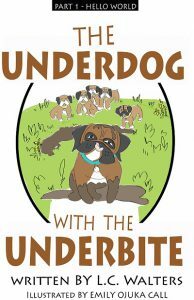 “The Underdog with the Underbite” is a heartwarming, u plifting, and encouraging series about a dog named Spud, The Underdog, who overcomes again and again against all the odds. Based on a true story, the story of Spud is a fun loving story of resilience and perseverance and overcoming the odds when it is all stacked against you. Spud encourages readers to persevere and overcome all troubles and to do it all with a smile, even if that smile contains an underbite like hers. May you laugh, learn, and live life to the fullest as Spud as you read the tales of “The Underdog with the Underbite”.